The below artworks are the most important by Vincent van Gogh - that both overview the major creative periods, and highlight the greatest achievements by the artist. Artwork description & Analysis: This early canvas is considered Van Gogh's first masterpiece. Painted while living among the peasants and laborers in Nuenen in the Netherlands, Van Gogh strove to depict the people and their lives truthfully. Rendering the scene in a dull palette, he echoed the drab living conditions of the peasants and used ugly models to further iterate the effects manual labor had upon these workers. This effect is heightened by his use of loose brushstrokes to describe the faces and hands of the peasants as they huddle around the singular, small lantern, eating their meager meal of potatoes. Despite the evocative nature of the scene, the painting was not considered successful until after Van Gogh's death. At the time this work was painted, the Impressionists had dominated the Parisian avant-garde for over a decade with their light palettes. It is not surprising that Van Gogh's brother, Theo, found it impossible to sell paintings from this period in his brother's career. However, this work not only demonstrates Van Gogh's commitment to rendering emotionally and spiritually laden scenes in his art, but also established ideas that Van Gogh followed throughout his career. Artwork description & Analysis: While in Paris, Van Gogh was exposed to a myriad of artistic styles, including the Japanese Ukiyo-e woodblock prints. These prints were only made available in the West in the mid-19th century. Van Gogh collected works by Japanese ukiyo-e masters like Hiroshige and Hokusai and claimed these works were as important as works by European artists, like Rubens and Rembrandt. Van Gogh was inspired to create this particular painting by a reproduction of a print by Keisai Eisen that appeared on the May 1886 cover of the magazine Paris Illustré. Van Gogh enlarges Eisen's image of the courtesan, placing her in a contrasting, golden background bordered by a lush water garden based on the landscapes of other prints he owned. This particular garden is populated by frogs and cranes, both of which were illusions to prostitutes in French slang. While the stylistic features exhibited in this painting, in particular the strong, dark outlines and bright swaths of color, came to define Van Gogh's mature style, he also made the work his own. By working in paint rather than a woodblock print, Van Gogh was able to soften the work, relying on visible brushstrokes to lend dimension to the figure and her surroundings as well as creating a dynamic tension across the surface not present in the original prints. Artwork description & Analysis: This was one of the first scenes Van Gogh painted during his stay in Arles and the first painting where he used a nocturnal background. Using contrasting colors and tones, Van Gogh achieved a luminous surface that pulses with an interior light, almost in defiance of the darkening sky. The lines of composition all point to the center of the work drawing the eye along the pavement as if the viewer is strolling the cobblestone streets. The café still exists today and is a "mecca" for van Gogh fans visiting the south of France. Describing this painting in a letter to his sister he wrote, "Here you have a night painting without black, with nothing but beautiful blue and violet and green and in this surrounding the illuminated area colors itself sulfur pale yellow and citron green. It amuses me enormously to paint the night right on the spot..." Painted on the street at night, Van Gogh recreated the setting directly from his observations, a practice inherited from the Impressionists. However, unlike the Impressionists, he did not record the scene merely as his eye observed it, but imbued the image with a spiritual and psychological tone that echoed his individual and personal reaction. The brushstrokes vibrate with the sense of excitement and pleasure Van Gogh experienced while painting this work. Artwork description & Analysis: Van Gogh's Sunflower series was intended to decorate the room that was set aside for Gauguin at the "Yellow House," his studio and apartment in Arles. The lush brushstrokes built up the texture of the sunflowers and Van Gogh employed a wide spectrum of yellows to describe the blossoms, due in part to recently invented pigments that made new colors and tonal nuances possible. Van Gogh used the sunny hues to express the entire lifespan of the flowers, from the full bloom in bright yellow to the wilting and dying blossoms rendered in melancholy ochre. The traditional painting of a vase of flowers is given new life through Van Gogh's experimentation with line and texture, infusing each sunflower with the fleeting nature of life, the brightness of the Provencal summer sun, as well as the artist's mindset. Artwork description & Analysis: Van Gogh's Bedroom depicts his living quarters at 2 Place Lamartine, Arles, known as the "Yellow House". It is one of his most well known images. His use of bold and vibrant colors to depict the off-kilter perspective of his room demonstrated his liberation from the muted palette and realistic renderings of the Dutch artistic tradition, as well as the pastels commonly used by the Impressionists. He labored over the subject matter, colors, and arrangements of this composition, writing many letters to Theo about it, "This time it's just simply my bedroom, only here color is to do everything, and giving by its simplification a grander style to things, is to be suggestive here of rest or of sleep in general. In a word, looking at the picture ought to rest the brain, or rather the imagination." While the bright yellows and blues might at first seem to echo a sense of disquiet, the bright hues call to mind a sunny summer day, evoking as sense of warmth and calm, as Van Gogh intended. This personal interpretation of a scene in which particular emotions and memories drive the composition and palette is a major contribution to modernist painting. Artwork description & Analysis: After cutting off a portion of his right earlobe during a manic episode while in Arles, Van Gogh painted Self Portrait with a Bandaged Ear while recuperating and reflecting on his illness. He believed that the act of painting would help restore balance to his life, demonstrating the important role that artistic creation held for him. The painting bears witness to the artist's renewed strength and control in his art, as the composition is rendered with uncharacteristic realism, where all his facial features are clearly modeled and careful attention is given to contrasting textures of skin, cloth, and wood. The artist depicts himself in front of an easel with a canvas that is largely blank and a Japanese print hung on the wall. The loose and expressive brushstrokes typical of Van Gogh are clearly visible; the marks are both choppy and sinuous, at times becoming soft and diffuse, creating a tension between boundaries that are otherwise clearly marked. The strong outlines of his coat and hat mimic the linear quality of the Japanese print behind the artist. At the same time, Van Gogh deployed the technique of impasto, or the continual layering of wet paint, to develop a richly textured surface, which furthers the depth and emotive force of the canvas. This self-portrait, one of many Van Gogh created during his career, has an intensity unparalleled in its time, which is elucidated in the frank manner in which the artist portrays his self-inflicted wound as well as the evocative way he renders the scene. By combining influences as diverse as the loose brushwork of the Impressionists and the strong outlines from Japanese woodblock printing, Van Gogh arrived at a truly unique mode of expression in his paintings. Artwork description & Analysis: Starry Night is often considered to be Van Gogh's pinnacle achievement. Unlike most of his works, Starry Night was painted from memory, and not out in the landscape. The emphasis on interior, emotional life is clear in his swirling, tumultuous depiction of the sky - a radical departure from his previous, more naturalistic landscapes. Here, Van Gogh followed a strict principal of structure and composition in which the forms are distributed across the surface of the canvas in an exact order to create balance and tension amidst the swirling torsion of the cypress trees and the night sky. The result is a landscape rendered through curves and lines, its seeming chaos subverted by a rigorous formal arrangement. 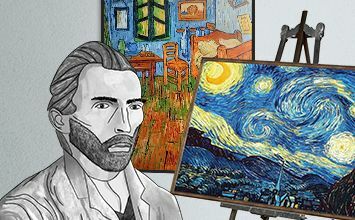 Evocative of the spirituality Van Gogh found in nature, Starry Night is famous for advancing the act of painting beyond the representation of the physical world. Artwork description & Analysis: After Van Gogh left the asylum at Saint-Remy in May 1890 he travelled north to Auvers, outside of Paris. Church at Auvers is one of the most well-known images from the last few months of Van Gogh's life. Imbuing the landscape with movement and emotion, he rendered the scene with a palette of vividly contrasting colors and brushstrokes that lead the viewer through painting. Van Gogh distorted and flattened out the architecture of the church and depicted it caught within its own shadow - which reflects his own complex relationship to spirituality and religion. Van Gogh conveys a sense that true spirituality is found in nature, not in the buildings of man. The continued influence of Japanese woodblock printing is clear in the thick dark outlines and the flat swaths of color of the roofs and landscape, while the visible brushstrokes of the Impressionists are elongated and emphasized. The use of the acidic tones and the darkness of the church alludes to the impending mental disquiet that would eventually erupt within Van Gogh and lead to his suicide. This sense of instability plagued Van Gogh throughout his life, infusing his works with a unique blend of charm and tension. Artwork description & Analysis: Dr. Gachet was the homeopathic physician that treated Van Gogh after he was released from Saint-Remy. In the doctor, the artist found a personal connection, writing to his sister, "I have found a true friend in Dr. Gachet, something like another brother, so much do we resemble each other physically and also mentally." Van Gogh depicts Gachet seated at a red table, with two yellow books and foxglove in a vase near his elbow. The doctor gazes past the viewer, his eyes communicating a sense of inner sadness that reflects not only the doctor's state of mind, but Van Gogh's as well. Van Gogh focused the viewer's attention on the depiction of the doctor's expression by surrounding his face with the subtly varied blues of his jacket and the hills of the background. Van Gogh wrote to Gauguin that he desired to create a truly modern portrait, one that captured the "the heartbroken expression of our time." Rendering Gachet's expression through a blend of melancholy and gentility, Van Gogh created a portrait that has resonated with viewers since its creation. A recent owner, Ryoei Saito, even claimed he planned to have the painting cremated with him after his death, as he was so moved by the image. The intensity of emotion that Van Gogh poured into each brushstroke is what has made his work so compelling to viewers over the decades, inspiring countless artists and individuals.